Hansgrohe is one of the world leading faucet manufacturers. They are renowned for their durable fixtures with minimalist and elegant designs. In the following article, we take a closer look at their products and examine what makes this brand great. 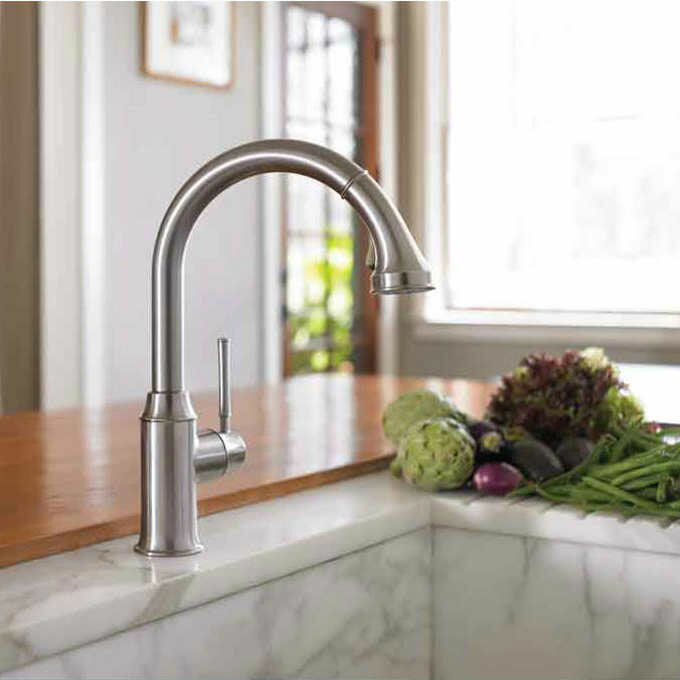 Read our Hansgrohe faucet reviews to find the right model for your kitchen. With a simple minimalist design, this kitchen faucet is one of the best looking products on our list. 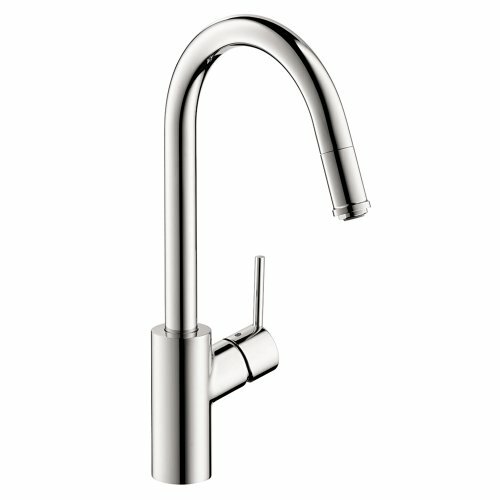 It comes with a high arc spout and a single lever control, making it very functional as well as beautiful. This is a timeless faucet that blends an attractive with great functionality. 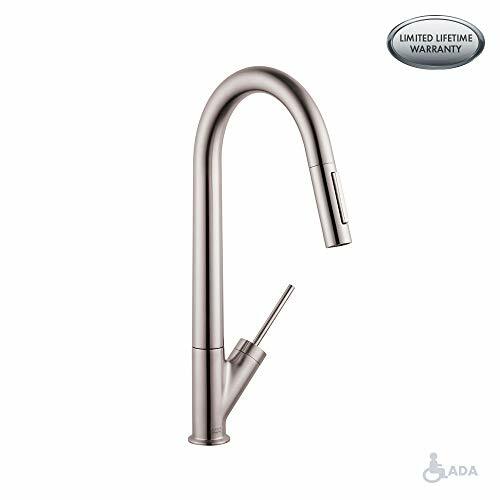 The high arc spout and the vertical lever make the unit beautiful and be effective at the same time. They look great, but they will be very helpful as well. The high arc spout will allow you to fill pots and clean them with ease, without having to use the pull-down feature. The vertical control lever gives you more space to manipulate the dishes and gives you total control while using only one hand. The spray head is easy to pull out of the spout, and it offers you two spray modes. The first one provides a full spray mode, while the second produces a needle spray. The first spray is good for everyday use, while the second is great at removing tough stains. You can change between the spray modes by pressing a button, and once you turn off the faucet, the spray modes reset. The pull-down feature is easy to use. The spray head rolls out easily, and when you finish using it, the magnetic docking technology will always bring it back in its place. The Allegro E model is a proof of Hansgrohe’s solid workmanship and advanced engineering. The faucet has beautiful lines and an ergonomic design which make it a great fit for every kitchen. 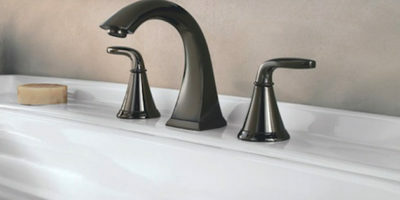 The faucet has a nice solid brass construction, so it has an increased durability. The Steel Optik finish is carefully applied, and the finish’s level of detail is amazing. This finish is great because it will match both the brushed nickel and the polished chrome finishes of other appliances and fixtures. One of the great things about this faucet is the engineering behind it. The faucet is high enough to be efficient at everyday tasks, like washing dishes of different shapes and sizes, but it’s low enough so water won’t splash when you turn it on. The single lever is easy to operate and works flawlessly, providing just enough resistance when you pull it. The pull-down spray head is easy to use, and it will lock in place every time you finish using it. The spray head comes with two different water flow settings. You can choose between a full spray and a thin one. The spout swivels within a 150-degree range. This is a great option for kitchen faucets because you need the mobility to clean certain objects, like pots or trays. Another great thing about this faucet is the easy installation. Not only is the installation process easy and straightforward, but all the component you need are already in the box. All the hoses have a high quality, as well. 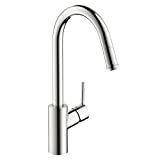 This is a great kitchen faucet with a single lever operation and an ergonomic design. The faucet requires a single hose installation, and it comes with all the components you need for this. The faucet looks great. It has sharp angles, bold forms, and clean lines that will make it look good in many kitchens. You can use it successfully in both traditional or modern style kitchens designs. One of the great features of this faucet is the boltic handle lock. The lock is designed to prevent the handle from becoming loose. This is a great feature to have in your kitchen faucet because it ensures the unit will be leak-free for many years. The feature will increase the overall durability of the faucet. The spout swivels at the base, but the high-quality engineering behind this product makes this process easy and leak-free. The base of the faucet will maintain its position, no matter how often you turn the unit. The spray head offers two spray modes. To change between the full spray mode and the needle one, you have to press the rubber piece on the spray head. Once press it, the spray setting is maintained until you turn off the water. The setting is restarted when you turn the water back on. This is an elegant kitchen faucet that blends practicality and design in a single unit. The faucet features an ergonomic pull-down spray head and has a single lever control. One of the first things you notice about this faucet is the high spout. Not only does this feature make the faucet look elegant, but it’s also very functional. This will allow you to clean larger pots without pulling down the spray head, and it will also make it easier to fill them. Another good feature is the magnetic docking. This feature will secure the spray head in its place every time you finish using it. Thanks to this feature, the spray head will always slide quietly back in its place. The QuickClean silicone is one of the many patented technologies Hansgrohe implemented on most of its products. The silicone is impervious to limescale buildups. This might not seem much at a first glance, but it’s actually very important in the long run. You won’t have problems with limescale deposits that can sometimes partially block the water flow. The spray head has two operating modes. To can change between them by pressing the rubber surface on the top of the spray head. If you want to change back, simply turn the faucet off and on again. The spout can swivel in a 150-degree radius. This is a good feature because it allows you to use more of the kitchen sink’s surface. 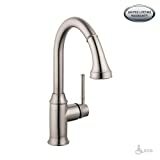 This is a modern looking kitchen faucet that comes with a pull-down spray head and a vertical control lever. The faucet has a slim appearance accentuated by the firm and straight lines in its design. What makes this kitchen faucet great is the simple design. With its straight lines and slim appearance, the faucet will be a great addition to every household. While this faucet might not be as flashy as other models, the great thing about it is its versatility. The minimalist design will allow you to use this faucet for both traditional and modern kitchen designs. The installation process is easy and straightforward. Everything you need to install this faucet comes in the box, so most people will be able to install it themselves. The pull-down handle is easy to use. It rolls in and out of the spout quietly, and once you finish using it, the magnetic docking technology will firmly lock it in place. The quality of this faucet it top notch. It has a solid brass construction for increased durability and it comes with high-end finishes. The spout can swivel in a 150-degree radius, so it’s comfortable to use when you have to clean larger objects. Combining the spout’s swivel with the pull out spray head will allow you to reach a larger area. This is a great feature for those who like cooking. The Hansgrohe Group is a European stock corporation that has two majority shareholders. One of them is an American corporation that owns 68% of the shares, while the second one is the holding company of the founder, Klaus Grohe. The company employed around 4,800 people in 2016 and sold their products in more than 140 countries. Hansgrohe celebrates 116 years in 2019. Hansgrohe is renowned worldwide for their products. People appreciate their kitchen and bathroom fixtures because they’re innovative, they have great designs, and they’re durable. All the components used for Hansgrohe’s kitchen faucets have a high quality, and they are also very practical. Most of their faucets have a single handle control to ensure an easier operation. If the faucet has a vertical control, the default design is to have the cold water at the lowest position to prevent scalding. 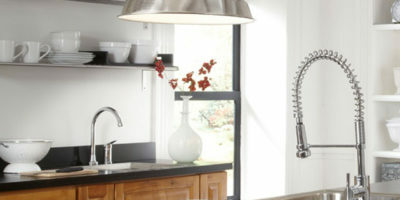 Most of the kitchen faucets produced by Hansgrohe have a modern contemporary design. They have firm straight lines, and they come in a large variety of finishes. This company produces one of the best finishing colors available on the market, the Steel Optick. This finish was specially designed to match both chromed and brushed nickel, so if your other fixtures and appliances have different finishes, the faucet can act as a centerpiece. The minimalist design usually found in their products make them great for both classical and modern kitchen designs. The great thing about Hansgrohe is the durability of their products. 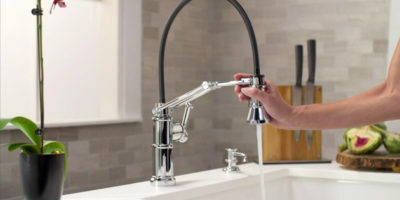 They usually use solid brass or stainless steel for their faucets’ structures, and the rest of the components are made out of high-quality materials, as well. This is one of the things you’ll notice as soon as you open the box. All the materials you need for the faucet’s installation come with it, and even the hoses have a higher quality than you would expect. Hansgrohe is one of the world leading faucet manufacturers. 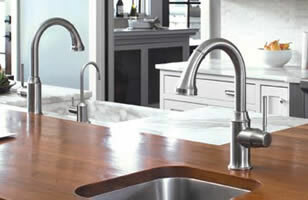 They produce some of the most durable kitchen faucets, and their products look great as well. We’re confident that after reading our list of Hansgrohe faucet reviews you were able to find a great model for your kitchen. 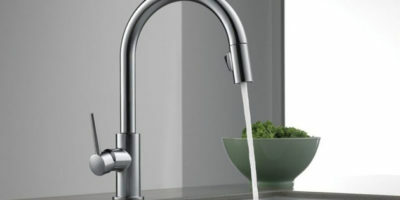 All Hansgrohe kitchen faucets have a nice minimalist design and come in multiple finishes. They mix functionality with good looks, so you can be sure you buy a long lasting product if you choose their products. 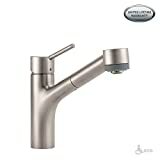 Can I get a review and rating on the Hansgrohe Talis M faucet?? Hi Miche, on the list!